Type L Series low pressure diaphragm seals feature removable, elastomer diaphragms that may be replaced or repaired if required. These seal elements are intended for low pressure sensitivity instruments such as bellows and diaphragm type gauges. They are sensitive to pressure changes as low as 2” H2O (51 mm H2O at 4°C). Type L Series diaphragm seals employ diaphragms retained between two bolted members. In the clean-out design, the diaphragms are situated between the top and middle ring. In the LB and LG design, the diaphragms are located between the top and bottom. The diaphragm is loosely retained in the upper housing for easy repair or replacement. 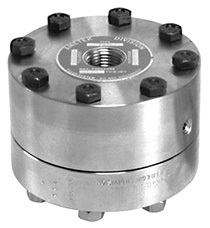 This extends the life of the seal element and allows for field replacement and service.